The pile carpet was a necessary household item for people living in Central Asia, where Turks originated. During their migratory life span, nomads wove a variety of woolen textiles such as tents, rugs, kilims (flat weaves), felts, coverings, sacks, and satchels, and this activity became an important part of their lives. To weave rugs, nomads made warps, wefts and knots from their animals’ wool. Turks brought their carpet weaving tradition along with them when they migrated from Central Asia toward the West. In their carpet designs, they reflected their own lives as influenced by the climatic and geographic conditions to which they were subjected. They also added influences from their new living conditions and the impact of local cultures, and continued their tradition, albeit with modified colors and designs. The Pazyryk rug, which is nowadays kept at the Hermitage Museum in St. Petersburg, is considered to be the earliest existing carpet, although this may change due to recent discoveries of possibly earlier piled rugs. It was discovered at the Pazyryk Burials in the Altai Mountains by the Russian archaeologist Sergei Rudenko in 1949. The rug, dating back to the 3rd-5th century B.C.E., was able to maintain its good condition due to its preservation within an ice grave. The size of the rug is 2 X 1.83 m; it was woven with very thin wool using symmetrical knots (Ghiordes knots). Rich figures showing horsemen, deer and mythic animals, and floral motifs can be seen in the ground of the rug. In 1906-1908, a carpet fragment (3rd-4th centuries) was found by Sir Aurel Stein in the Lou-Lan city of Eastern Turkestan, and another knotted carpet fragment (5th-6th centuries) was found in Kizil in Turfan. These were the following oldest examples after the Pazyryk rug. The fragment, which is preserved at the San Francisco Fine Art Museum today, was discovered in the 1920s by Lamm in Fustat. It dates back to the 7th-9th centuries and shows stylized animal depictions and geometric motifs in the ground. The Seljuk carpets, which emerged after the arrival of the Turks in Anatolia, were first discovered in 1906 by J. H. Loytved-Hardegg and F. R. Martin in the Konya Aladdin Mosque. This group, currently preserved at the Turkish and Islamic Arts Museum, consists of nine pieces in total, including three large carpets and six fragments. 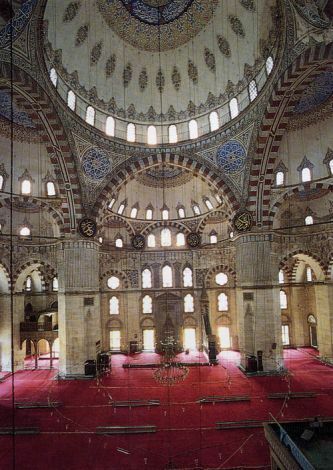 In 1930, R. M. Riefstahl discovered four more carpets in the Beyşehir Eşrefoğlu Mosque. As of today, three of these are at the Konya Mevlana Museum, while the other has been separated into two pieces with one piece at the Keir Collection in London, and the other at the David Collection in Copenhagen. Seljuk carpets are of large dimensions and have woolen wefts and warps. The carpets have symmetrical (Ghiordes) knots and are notable for their red, white, dark blue, light blue and yellow colors, Kufic borders and geometric designs. They also display plant motifs that have been adapted to a geometric scheme. Following the Seljuk carpets, figurative carpets appeared in Anatolia, which were depicted in paintings by Italian artists in the 14th and early 15th centuries. In addition to geometric designs, these carpets show human and animal figures such as birds and four legged animals. Furthermore, many also display designs resembling Chinese textiles. Journals of explorers such as Marco Polo, Ibn Battuta, and Ibn Khaldun, as well as commercial documents, indicate to us that the art of carpet weaving in Anatolia and in Eastern countries was well-developed during that period. Carpets were being woven around Aksaray, Konya and Sivas, and exported to neighboring countries. Early Ottoman carpets were developed even further, and exported to Europe as well as to Eastern countries and Egypt as important items of commerce during that time period. Carpets were also presented as diplomatic gifts. “Lotto” group carpets were named after the Italian painter Lorenzo Lotto (1480-1556), who frequently depicted them in his paintings. Lotto group carpets have symmetrical knots, geometric motifs and Kufic borders on red ground. Another group of carpets was named the “Holbein” type, as they were often seen in paintings by the Young Hans Holbein. These carpets are divided into two categories based on their design, namely “Small Holbein-type,” and “Large Holbein-type.” Small Holbein-type carpets are embellished with small octagons and diamonds, while Large Holbein-type carpets are dominated by a large octagonal medallion inside a square. Both types display a main field with geometrized plant motifs, surrounded by a Kufic border. While this group of carpets is depicted in Western paintings, they are also seen in Islamic miniatures. Oghuz Turks, who settled all over Anatolia, continued to weave carpets in their new homeland dominated by designs called the “Turkmen rose,” composed of small octagons. After the Holbein group carpets gained their identity as “Ottoman carpets” during the Ottoman Empire of the 16th century by blending in local cultural influences from Anatolia, one can make the claim that regardless of any size distinctions, they were woven in new compositions at court workshops and in all areas with Turkmen settlements. During the 16th century, the Ottoman Empire began to live its golden age as it expanded its territories and strengthened its central administrative government. Ottoman sultans commissioned large carpets for the mosques that they had built. Animal figures and geometric designs, which were important elements in carpets up to that time, were enriched with more graceful and sophisticated outlines and designs such as plant, chintamani, and cloud motifs, and a transition was made to large medallion or star Uşak carpets. Subsequent to Selim the First’s conquest of Tabriz (1514) and Cairo (1517), under the influence of diverse cultures from foreign lands, carpet varieties also proliferated: pastel colored carpets with medallion designs, woven in asymmetrical (Persian / Senneh) knots in a blend of cotton and silk threads, emerged in court circles. They were woven not only for use in the palace, but also to be presented as gifts to high level foreign dignitaries, or as custom-ordered mansion carpets. The Ehl-i Hiref Journals note that master artisans were brought to Istanbul from Tabriz and Cairo and assigned to work at the Topkapı Palace. These masters conducted production for the palace, not just in carpet weaving but also in a multitude of art forms. On the other hand, designs of Anatolian wool carpets were traditional, and colors, derived from plant-based dyes, were warm and endearing. When the Sultan commissioned carpets from workshops, they would send a sample notebook including the designs and colors they requested, and it was imperative that their requests were fulfilled. The workshop was also warned to work meticulously and complete the assignment on time. The Narh Registry, dating from 1640, indicates that Western Anatolia, especially Uşak, continued to be an important carpet production center in the 17th – 18th centuries as well. Ottoman carpet weaving had its greatest breakthrough with prayer carpet manufacturing. Prayer carpets can be woven for a single individual with one mihrab (niche) each, or as saf prayer carpets with multiple mihrabs side-by-side in a row. Prayer carpets that exhibit regional characteristics became widespread after the 17th century. In Anatolia, there are centers that weave prayer carpets of distinct character, such as Ghiordes and Kula in the province of Manisa; Milas in the province of Muğla in Western Anatolia; and Ladik, Taşpınar, Kırşehir and Mucur in the province of Konya in Central Anatolia. Ghiordes gained fame in the 17th century with its prayer carpets, and exported a significant number of carpets between the 18th and 20th centuries. Apart from these towns famed for their prayer carpets, the Balıkesir region, which boasts an old tradition, and today still continues its export-based production, should also be noted. Sources indicate that the Yüncü, Yağcıbedir and Tahtacı nomadic tribes settled in this area between 1515 and 1571. Starting with the 17th century, the Ottoman Empire’s political situation began to deteriorate and it had an adverse impact on its economy, which continued its increasingly steep downward spiral in the 18th and 19th centuries. In addition, Westernization movements were felt in every field from industry to culture and art. In Europe, Eastern and in particular Ottoman carpets were greatly in fashion. However, their extremely high costs and long delivery time obliged Westerners to copy these carpets. While factories imitating Turkish carpets were being built in Europe, the industrial revolution had started. When a French engineer named Jacquard used a punched card system in order to speed up hand weaving looms, textile production around the beginning of the 19th century simply exploded. In 1834, the same system started being implemented on carpet looms. At the same time, Western nations were signing commerce treaties with the Ottoman Empire. As a consequence of the first commerce treaty with Britain, the trade advantages provided to them by the Ottomans would have to be provided later on to other nations as well. Subsequently, trade offices and companies funded with foreign capital were established in Istanbul and Izmir in order to focus on marketing carpets. The most well known of these was the Oriental Carpet Manufacturers Company (O.C.M. ), which was headquartered in Izmir in 1908 and organized carpet weaving in Western Anatolia. The company, established a carpet factory in Isparta, created a network throughout the region, placed orders with local weavers, and procured all materials and designs itself. Its operations continued until the demise of the Empire and, when the company left the country, regional carpet manufacturing came to a standstill. The re-development of regional carpet manufacturing started after the Republic was established. Faced with these technical advances in the West, the Ottoman Palace also attempted to develop its own industry. The initial result of these initiatives, the first period of which took place between 1840 and 1860, was the establishment of palace factories by the government. The Feshane Palace Factory was founded in Kumkapı, Kadrıga in Istanbul under the name of Dârüssınâa. It was expanded in 1833-1839, and moved to Defterdar in the vicinity of Eyüp. Carpet production in Feshane started after 1843, and continued until 1914. Since Feshane mostly manufactured for the palace, its products can be found in the Zülveçeyn Hall of the Dolmabahçe Palace, the Yıldız Chalet Mansion and the Beylerbeyi Palace. Designs are very different from those of Anatolian carpets. Some carpets have the Ottoman inscription of Feshane in a corner. As they are products of a Westernization stage in Turkish art, they resemble Aubusson carpets from France, whose influence was the most strongly felt. These carpets display influences of Baroque art with curved, lively borders, flower bouquets, peacocks, bright red and other colors. The second of the Palace Factories was Hereke. The looms, which were first set up in a workshop inside the Dolmabahçe Palace in order to meet the textile demands of the palaces, were moved during the time of Sultan Abdülmecid to Hereke in 1844. In 1881, Sultan Abdülhamid II enlarged the textile factory in Hereke, with 100 carpet weaving looms. In 1891, a carpet division was established in the factory and in addition to carpets woven for the palace, others were also woven for sale on market. Initially, Hereke carried out its production according to samples forwarded by the Topkapı Palace, and later created a wide array of products from floor carpets to prayer rugs and specially commissioned carpets in very distinct dimensions and design schemes. Since there are numerous examples of these carpets, which have an Ottoman “Hereke” inscription, they are better known than Feshane carpets. Feshane is no longer in operation, but Hereke continues its production. Today, carpet weaving still continues in villages in Anatolia, although the number of carpets being made has been reduced. It is noteworthy to mention the successful DOBAG project (a Turkish acronym for Natural Dye Research and Development Project,) which has produced superior carpets since 1981 with natural plant dyes and traditional Turkish motifs in the villages in northwestern Anatolia around Çanakkale-Ayvacik and the Manisa-Yuntdağ region. Following the DOBAG project, many similar reproduction projects have been conducted, not only in Turkey but also abroad. The Cultural Heritage Preservation and Natural Dyes Laboratory (DATU) is making significant contributions to our understanding of historical Turkish carpets. Through its various projects with leading Turkish museums, DATU provides free-of-charge analytical services to museums that guide in preservation and restoration efforts. DATU scholars also conduct field studies across Turkey to revive Turkish weaving traditions and collaborate with the ARMAGGAN brand in the production of new Turkish kilims and carpets.